Other Ingredients:Capsules: microcrystalline cellulose, hydroxypropyl methylcellulose (vegetable cellulose capsule), silica. Tablets: xylitol, natural chocolate and vanilla flavors, stearic acid, vegetable source magnesium stearate, silica. No:Capsules: sugar, salt, yeast, wheat, gluten, corn, soy, dairy products, artificial coloring, artificial flavoring, or artificial preservatives. Tablets: sugar, salt, yeast, wheat, gluten, soy, dairy products, artificial coloring, artificial flavoring, or artificial preservatives. Recommendations:1 capsule or tablet daily with food. For long term use, consult a healthcare practitioner. 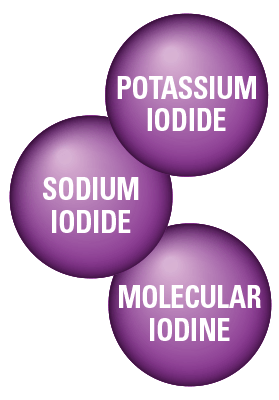 The best iodine supplement I've ever tried. I used it to relieve premenstrual breast tenderness and it worked! * I've tried other ones that didn't. "I just met you at "Peach Tree" in Columbus Georgia last weekend. I told you about my health, and you suggested Tri-Iodine for my thyroid. I want to tell you that I now wake up feeling terrific. Thank you soooo very much for your wonderful advice !!!! I even have more energy during the day, thank you again and God Bless you and all the work you do!"